Our fishing pond is located at the intersection of Laurel Valley Road and US-23. There is no fee for fishing. You must provide your own fishing poles/equipment and bait. There is also a nice walking trail around the pond. Picnic tables and rocking chairs are also provided, so don't forget to pack a lunch! Open daily, year-round, to guests of the resort and local residents. There is an abundance of fishing spots all around the area. However, to fish in creeks/streams/rivers you will need a NC fishing license (temporary licenses are available). You can purchase fishing licenses at Builder's Express in Mars Hill. Just follow I-26 towards Asheville and take Exit 11 - Mars Hill. Turn left at light and you will find Builder's Express about one mile on the right. Turn left at Bright Hope Laurel Baptist church at the intersection of Puncheon Fork Road and Laurel Valley Road. Follow the signs. Located at 770 Watershed Rd., Mars Hill, NC 28754. Open Saturday (9 AM to 6 PM) and Sunday (1 PM to 6 PM) ONLY. $4.00/pound fee. You must keep what you catch. They will clean the fish for a fee. 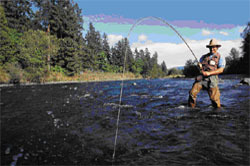 Fishing poles are provided at no charge, but you must pay for your bait.